This bucket holds water better than any other bucket I've tried! 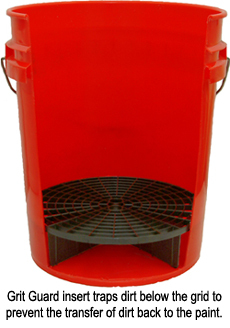 If you need water held in a bucket, this is the one for you! ProsHolds water. Holds almost anything else that will fit in a 5-gallon bucket. Empties easily. Waterproof. Handle included at no extra cost. Convenient cylindrical shape. ConsCan injure or kill small children who may fall into the bucket head-first. Does not double as a television remote control. Purchased two of the buckets and to get the grit guard to fit I have to shove very hard to get to the bottom. Even then it still does not sit flush to the bottom of the bucket.